1) Whisk egg yolks and sugar until the sugar dissolves. 2) Gradually add in vegetable oil, followed by water. 3) Sift cake flour and cocoa powder twice and add into egg yolk mixture. Mix until just combined. Set aside. 4) In another bowl, whisk egg whites until foamy. Add in combined sugar and corn flour mixture gradually and continue whisking until stiff peak form. 5) Gently fold in the egg white into the egg yolk batter (in step 3) in 3 batches. 6) Pour the batter into an ungreased chiffon tin. Give the tin a few slight knocks on the tabletop to remove air bubbles. Bake in preheated oven at 170 deg C for 40 minutes (update on second attemp: lower to 160C for the last 10 mins). 7) Remove from oven and invert the tin immediately onto a cooling rack. 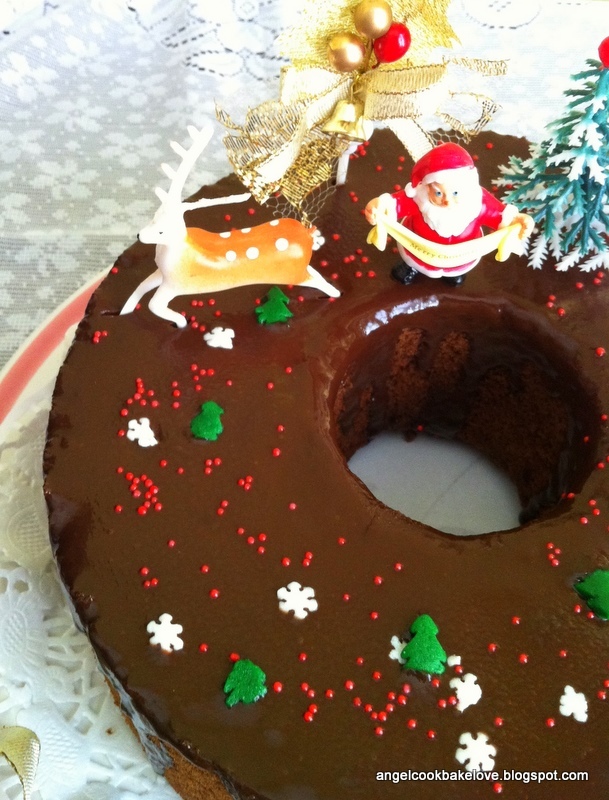 Unmould the cake only when it is completely cool. I have made a simple chocolate ganache to go with the chocolate chiffon and I would say that the combination is very good. 1) Cook whipping cream over low heat till it starts to boil. Remove from heat. 2) Pour cream over to chocolate and gentle stir till all chocolate is melted. 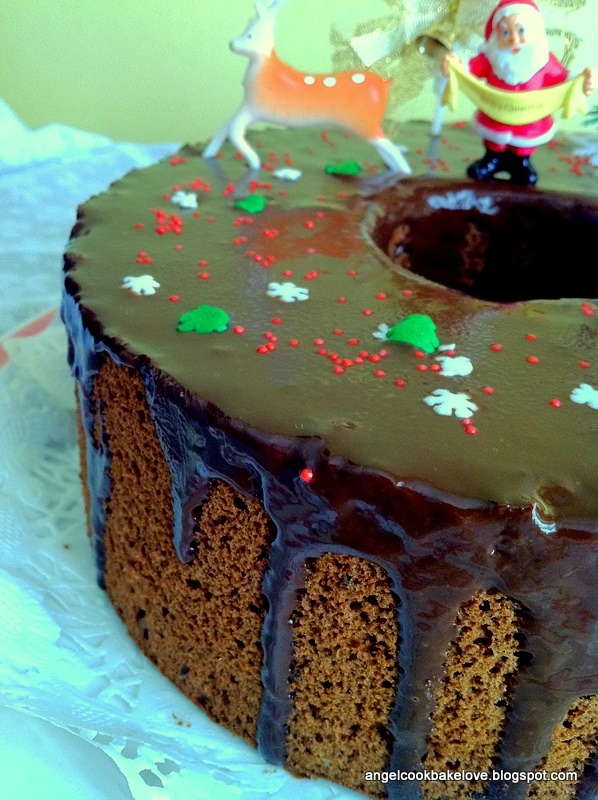 3) Pour ganache over cooled cake and let it set. Decorate as desired. Chill the cake in the fridge before serving. 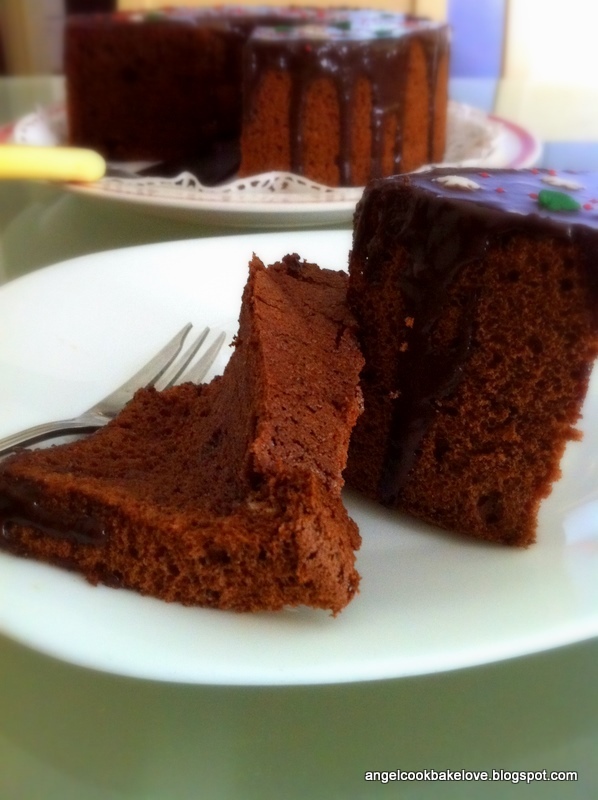 Take out cake from the fridge 5-10 mins before serving. 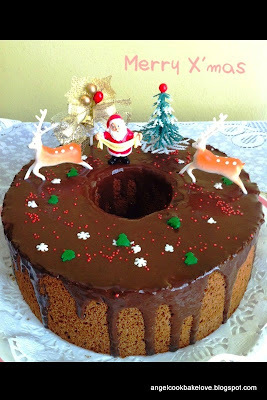 I am submitting this to Aspiring Bakers #14: Creative Christmas Bakes (December 2011), hosted by Hankerie. This look really soft & yummy with the ganache. 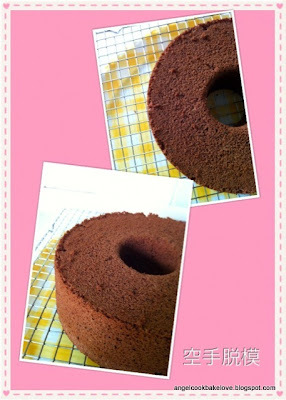 I have so long did not bake a chiffon cake, oh, i need to bake this chiffon soonest since you highly recommend it . Happy New Year 2012! Yes. The general term for the "Pancan cake" you mentioned is chiffon cake, so this is actually a chocolate flovour "pandan cake". 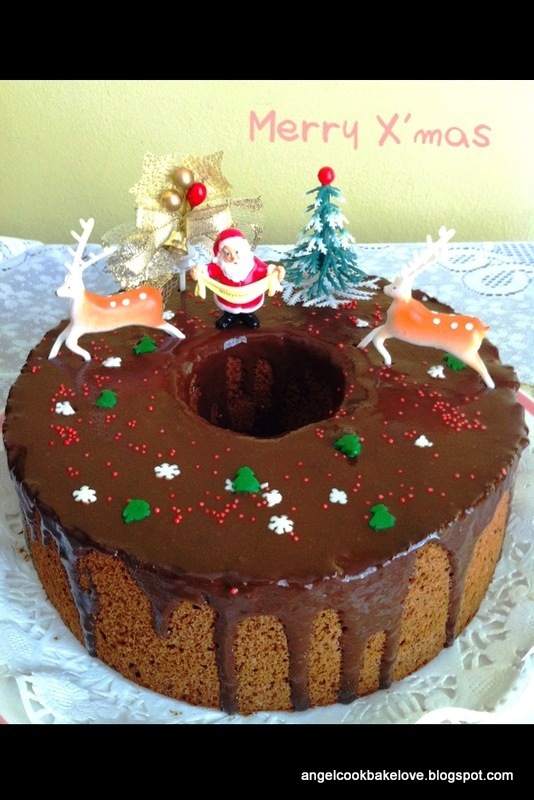 I think it should not be a problem to add mousse in between layers but again this cake is very soft, I suggest you chill it for a while before slicing.